That’s what I call a fresh idea! We have seen plenty of PDF converters (that can create PDF files and eBooks from MS Word, RSS feed, etc) but this is the first time I’ve seen a tool that positions itself as a magazine creator. 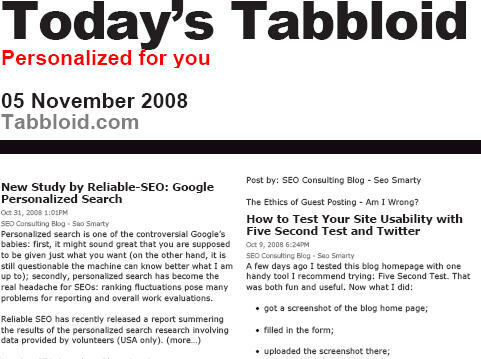 Basically, Tabbloid does nothig more than conerts the RSS feed you submit into a pretty two-column magazine-style PDF file – but congrats to the guys for a clever linkbaiting idea.